The reason why we help others at a cost to ourselves has long presented a puzzle for scientists. Why do some of us do it more than others? And are we doing it because we are truly moved by the suffering of others or simply because we feel we ought to return a favour or even get something in return? Looking at behaviour alone, it can be hard to tell. Both empathy and the principle of reciprocity – giving to return a favour or expecting others to do so – are proposed explanations for altruism which have been impossible to separate until now. Using functional magnetic resonance imaging (fMRI), which measures blood flow changes in the brain, a new study suggests that specific differences in connectivity between brain regions can predict whether someone is an empathy-driven altruist, a reciprocity-driven altruist – or just selfish. In the experiment, 34 female participants were divided into two groups. Those in the “empathy” group witnessed an actor receive painful electric shocks – and received shocks themselves (so they knew it hurt). In the “reciprocity” group, participants were paired up with actors who kindly paid money so the participant received fewer shocks (although both groups received the same number of shocks overall). Ulterior motive or clean conscience? Next, their brains were scanned. During the scanning, participants were asked to split a sum of money between themselves and another person. For the empathy group, the other person receiving the money was sometimes the partner they saw shocked. In the reciprocity group, the person was sometimes the partner who paid for the participant to receive fewer shocks. At other times, participants were simply asked to split the cash between themselves and a neutral person who neither received shocks nor did anything nice. The researchers could therefore divide the participants into those empathy-driven altruists and reciprocity-driven altruists based on the first part of the experiment. They could also use the way participants split the money in the second part to identify selfish individuals among these participants. Unsurprisingly, the initial analysis showed that participants gave, on average, larger sums of money to the empathy and reciprocity partners than to the neutral partner – and that both groups were equally generous. Those that most regularly chose splits involving more money for themselves than the other were classified as “selfish”. But this was just the starting point. The researchers used a complex and sophisticated follow-up to gain deeper insight. 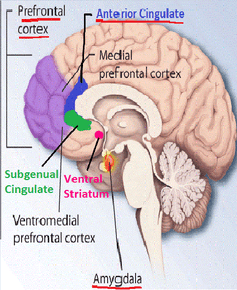 Ventral striatrum and anterior cingulate. 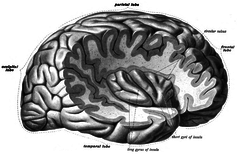 By looking at the timing of activity in the anterior cingulate cortex (known for a host of functions from pain and conflict to learning), the anterior insula cortex (associated with arousal and emotion) and the ventral striatum (associated with rewards and learning), the researchers created models of how information was passed between these areas. Then a computer algorithm tried to guess, based on these models, whether an individual’s altruistic decision had been motivated by empathy or by reciprocity. The high accuracy of these guesses at 77% shows the two groups of participants had brain activity patterns that differed enough to classify. In empathy-driven altruism, the anterior insula (emotion and arousal) and ventral striatum (rewards) showed a lower than average connectivity, while reciprocity-driven altruism showed increased connectivity between these regions. Connectivity in this sense can be imagined as how much one area is “talking to” another. Although the functions of these areas are broadly known, the meaning of changes in connectivity is still difficult to interpret. The results also showed differences in brains of those who had been classified as selfish or altruistic based on their decisions. Selfish individuals showed lower than average connectivity from the anterior cingulate cortex to the anterior insula whereas altruists had increased connectivity between these regions. Can we learn to be more altruistic? When it comes to implications, the differences between primarily selfish or primarily altruistic participants may be the most important finding. Inducing empathy, by seeing someone shocked, increased giving and associated neural connectivity for selfish individuals – they were more generous to the shocked partners than to the neutral person. The altruistic people, however, shared just as much with the neutral person as the shocked partner. The opposite was true for the reciprocity effect: increased giving to the partner who paid to prevent their shocks was seen in altruistic but not selfish participants. One could speculate that this implies that altruistic participants are already giving because of empathic motivation, so increasing empathy makes no difference – they are at their “empathy capacity”. Similarly, selfish participants may already be acting due to motivations more likely to benefit themselves too, such as reciprocity. Research on altruism regularly concludes that people have an empathetic motivation but this paper suggests potential for future studies to check whether this is the case for each individual participant. The authors also open doors to more specific measures and targets for further research on reciprocity and empathy. The paper shows the importance of analysing subtle differences in brain communication rather than overall activity. Looking at different brain regions working together, rather than in isolation, can identify previously elusive psychological concepts, such as underlying motivations. Future research is needed on whether these increases in altruism and neural connectivity could last, perhaps with ongoing training. For example, if the techniques used to induce empathy in the study could be employed in some sort of treatment for antisocial behaviour. However, charities can already make the most of the current findings. They suggest empathy-inducing appeals may be most effective for new supporters, who are not yet “altruistic enough” to donate. Existing supporters, who are already altruistic, may respond more to receiving a token gift they feel they can reciprocate by increasing their donations. The effectiveness of these techniques, already used by many charities, may be explained by the findings. But with limited resources, new insight into cognitive processes that might be harnessed by appeals could help society be a bit more generous.